Building muscle has been grossly over-complicated in the fitness industry for the last two decades. My approach is one of simplicity. As Bruce Lee said, strip away the unessential. It’s only when you hone your training down to the essentials, do you actually experience incredible results. This is where MEGA Training comes in, or Minimum Effort Growth Acceleration Training. MEGA Training is a training style I have coined that focuses your efforts on the key exercises and lifting protocols that will produce the most powerful gains. The ability to cover all your bases over fewer workouts and fewer exercises will allow for a much faster rate of strength and muscle gains. This is because you will experience better recovery, both neural and muscular, and you will be able to train without compromising intensity or psychological arousal. As natural lifters, we’re not very good at doing multiple things at once. Recovering from a torturous amount of training volume and making consistent improvements in strength and power is very hard to do. If I can build you up to incline bench-pressing 250 lbs for 6 reps and hammering out chin-ups with 100 lbs for 6 reps, your physique is going to be packed with muscle. In fact, when was the last time you saw a three-plate bench presser complaining about his lack of chest size? The answer is never! And that is why so many people are struggling to gain muscle; they’re training in a way that is unproductive for building strength. To me, lifting is a system of fine calibration. Every workout is a means to improve in weight lifted or reps performed. If myself, or a client, fails to make the scheduled progression, I go in there and make an adjustment to keep the ball rolling. Throughout the years, this often meant reducing the training volume significantly. Lifting on non-consecutive days for maximum neural recovery, limiting my workouts to 4-5 exercises of only 2-3 sets and taking 3 minutes of rest between heavy sets has resulted in downright incredible results. At the very heart of this style of training is a lifting protocol that is hands-down the most sensible way to train for strength and hypertrophy. To milk the most strength and muscle gains out of a lift, I use a technique known as reverse pyramid training. This involves performing one heavy set with maximum effort followed by one to two progressively lighter sets with full rest periods between all sets. By performing the heaviest set first, you are completely fresh. This allows you to lift at your true potential. And by doing so, you will set yourself up for consistent personal records on each and every lift. Now, one heavy set per exercise is all you need. If you try to repeat that set multiple times, you will create excessive neural and mental fatigue. What that heavy set triggers is a state known as postactivation potentiation, resulting in greater muscle fiber recruitment and force. When you follow your heavy set up with 1-2 lighter sets, you increase the muscle-building stimulus on those lighter sets. Let’s say bench pressing and your goal is 200 lbs for 5 reps. After a couple low-rep build-up sets, you’d do 200 lbs for 5, 180 lbs for 6-7 and 160 lbs for 8-9. With each subsequent set of reverse pyramid training, you want to shoot for 1-2 additional reps. Make sure to take a full three minutes of rest between these sets. I have used this training protocol to build up to a 315 lbs bench for 4 and 135 lbs weighted chin-ups for 4 at a bodyweight of 185 lbs. It really is that effective. This occurred while I was training only two or three days per week. If you use reverse pyramid training to build a high level of relative strength, you will move towards what I refer to as the ‘Greek God Physique’. This is a physique categorized by a very solid level of muscle development and proportion. Think Brad Pitt in Troy or Daniel Craig in Skyfall. Taut waist, v-shaped back, square chest and well defined legs, shoulders and arms. But there’s a step beyond that, which is a look I call the “Superhero” physique. For adequate examples, just look at Henry Cavill in Man of Steel or Chris Hemsworth in Thor. This is similar to the ‘Greek God Physique’, but with an extra 10 pounds of ‘pretty’ muscle. This extra size is the result of enhanced fluid and glycogen in the muscles. 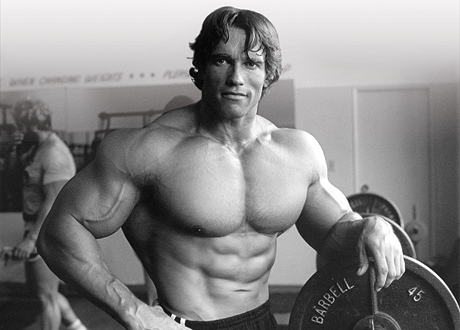 This gives your physique a fuller and more powerful look. To achieve this Superhero physique, we need to bring in a form of pump training. By itself, pump training is a horrible replacement for proper strength training, but when combined strategically, it works wonders. The style of pump training I’m about to share with you will allow you to gain an additional 6 to10 pounds of “pretty” muscle. Think of it as the cherry on top. Before we get into the form of pump training that works best, we need to understand what this kind of training is for. Normally, the goal of pump training is to create a high degree of cumulative fatigue using lighter weights with short rest periods – which creates a massive pump. This type of training stimulates increased glycogen storage in the muscle and sarcoplasm, the fluid-like substance in the muscle. While this produces very quick results (the “pump effect”), those results top off pretty quickly. Meaning, there’s only so much sarcoplasm and glycogen you can stuff into your muscles before they’re full. Lighter weight training results in limited muscle fiber recruitment, except for those last few really challenging reps.
To enhance this training stimulus, I utilize a technique known as “Rest Pause” training. With rest pause training, you’re doing one high-rep activation set followed by multiple “mini sets” with only 10-20 seconds of rest between sets. Limiting rest after a high rep set to only 20 seconds lets the body maintain the temporary state of heightened muscle fiber recruitment. Four to five of these “mini sets” are all it takes to trigger a high level of muscle growth. Keep in mind, you want to use the same weight on your mini sets as your initial activation set. This is due to the fact that you’re only resting 10-20 seconds. Rest pause training is like a muscle-building loophole that allows you to get enhanced muscle fiber stimulation with a light weight. Let’s say I’m doing dumbbell lateral raises. I might do 40 lbs for 12-15 reps, followed by 4-5 sets of 3-5 reps with only 10-20 second rest between. Here’ another way of putting it: 40 lbs for 12-15 reps + 3-5, 3-5, 3-5, 3-5, 3-5 reps (20 seconds of rest between sets and same weight for all sets). The goal is to build up to 15 reps on the activation set and 5 sets of 5 reps with no more than 20 seconds of rest between sets before increasing the weight. Here is how I would craft a MEGA routine to trigger solid and proportionate muscle growth for your entire physique. You’ll also notice some of the best shoulder gains of your life. The combination of heavy shoulder presses done reverse pyramid style with lateral raises and rear delts done rest pause style works wonders. Any stubborn body part you thought you had will finally be brought up to speed once and for all. RPT = Reverse Pyramid Training. Reduce the weight by around 10% for each subsequent set. For example, if you did 80 lbs dumbbell shoulder presses for your first set, you’d go down to 70 lbs for your second set and 60-65 lbs for your third set (it doesn’t have to be exactly 10%). Rest a full 3 minutes between these sets. When you can hit the top end of the rep interval for a set, increase the weight of that set by 5 lbs the following workout. For weighted pull ups, use total weight (bodyweight + additional weight) when determining 10%. For rest pause training pick a weight you can do for 12-15 reps. After which, rest 15-20 seconds and perform 3-5 reps. Do 4-5 of these mini sets. The goal is to build up to 15 reps on the activation set and 5 mini sets of 5 reps with no more than 20 seconds rest between sets. I challenge you to try the above routine for three weeks, and tell me you don’t experience some of the best strength and muscle gains of your life, even on lifts you’ve previously plateaued on. Lifting just three days per week with only five exercises per workout might scare you to death, but this is the power of MEGA Training. You might be tempted to stack more exercises and more workouts on top of this routine, but that is precisely when the power of the routine will be compromised. When you build up your physique with a lower volume approach some amazing things will happen. One, you’ll be a lot stronger than you look. Building size without living in the gym requires you to get very strong. Secondly, you will maintain your muscle size effortlessly. If you take a couple weeks off the gym, you’ll hardly notice a difference. Furthermore, if you’re cutting to low levels of body fat, you’ll find you maintain your muscle size without any issues. Finally, with such a training approach, you will be able to enjoy life. I am a firm believer that fitness should enrich your life, not consume it. When you are able to make the best gains of your life training just three days per week, life becomes quite remarkable because you can enjoy it outside of the gym. Gregory O'Gallagher is the author of the Greek God Program and founder of kinobody.com. He teaches men how to build proportionate muscle and achieve low levels of body fat with a downright unorthodox approach. Lifting three days per week, eating incredibly satisfying meals every day and reveling on weekends is all part of the package. Getting dramatic results with such a protocol may sound too good to be true, but every week, new transformations and testimonials come in from both his online coaching clients and those following his fitness courses.